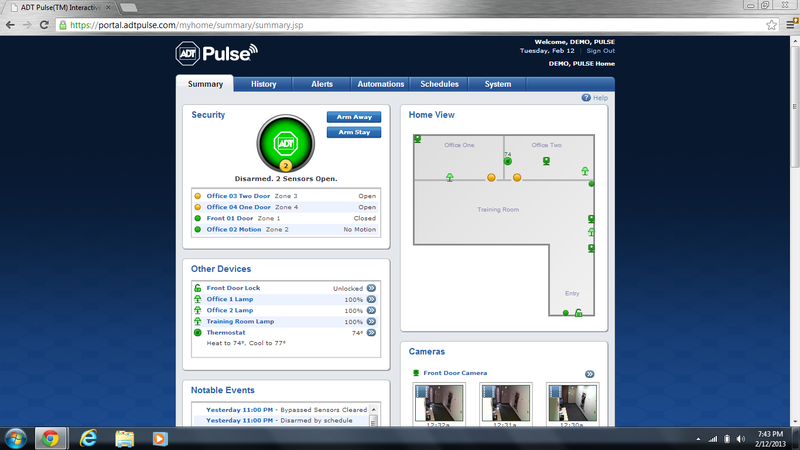 We installed an ADT Pulse security system in our training room to use for demonstrations. It is complete with the new ADT Pulse touchscreen control center, new outdoor camera, ADT Pulse thermostat and multiple lamp modules. It has been exciting to experiment with the ADT Pulse security system and to see how it works. From the iPhone, iPad and Android apps to using the system with the with the touchscreen control center, this system rocks. ADT is once again leading the way in home security and setting the stardard for the security industry. One of the best things about the ADT Pulse system and monitoring service is the ADT personalized web portal. It gives you a summary of your ADT Pulse system and status, history of events, alerts, automation, schedules and system details and devices. What are the benefits of your personalized web portal... let's take a closer look. The Summary tab shows you the status of your ADT Pulse security system. It tells you whether the system is armed or disarmed. Gives you the ability to remotely arm or disarm with a click of your mouse. Tells you whether door or windows are open or closed. It also has a Home View section, which is a floor plan of your home and the location of each of your security devices. From the Home View section you can click on a device's icon and get the status of the device. When the device is green everything is good, yellow means it is not ready and red means the device is troubled and may need service. The Home View makes it really convenient to use the Pulse system. It also has a section for Other Devices including cameras, thermostats, lamp modules and door locks. It has a section for your Cameras including recent snap shots. It also shows you Notable Events history and Today's Schedule for your security system including your home automation schedule. The History tab gives you an option to choose a time period to see history events. You can also filter history events by individual security devices like a motion sensor or camera. You can filter the type of history you would like to see or just view all of the event history of your security system. The history filter is fantastic because it gives you the ability to easily look at only the history of what you are interested in by time and device. You can also just look a alerts, automations, schedules, notable events, stored pictures and video clips or the site access history of your security system users. If you want to know what happened with your ADT Pulse security system... it's super easy! ADT Pulse allows you to set up Alerts via text messing or email of alarm events or individual device events. This keeps you informed that all is well at home and helps you keep an eye on things when your away. You will need to set up triggers of things that are important to you and your family. For those who have ADT Pulse cameras installed you can have pictures or video clips emailed or text to you attached to an event. What would you like to be notified of? The most popular use for Alerts is for homeowners to be notified of emergency alarm events. Customers also like to be notified when their security system is armed or disarmed. Often people want to be notified if their security system is not armed by a certain time each work day so they can remotely arm it. Parents with school age children like to be notified whenever the system is not disarmed by the time the kids are supposed to be home from school. With motion activated video monitoring with front door ADT Pulse cameras, homeowners like to be notified anytime someone is at their front door. The possibilities are endless but what is important is you are able to customize what you want to be notified of and want matters to your family. Automation and scheduling help you setup your system to do things that you programed once and the system does it based on the parameters you set. They make managing your home simple. Although customers with a basic security system can use automation and scheduling, it really is helpful for customers who get the home automation with thermostat control, lighting control and automated door locks. Automations are based on when a triggered event happens, the security system will then automatically do something else. Automations can be setup to be different depending upon the time and the day of week. Schedules are things you schedule to be done at certain times on set days of the week. An example of an automation is when I arm my security system to AWAY MODE I want my thermostat to be set at 75 degrees, my lights to be turned off and my automated front door dead bolt to lock. Automations are extremely important when it comes to managing the energy use of heating and cooling your home. Energy savings can be substantial. The System tab is the last tab of your ADT Pulse personalized web portal. It tells you the status of each device of your security system and lets you know that everything is working properly. It also allow you to manage your ADT Pulse site settings, users, access codes, your ADT portal profile and profile history. One of the most used parts of the System section is ADT Pulse Modes. Modes allow you to touch one button and have multiple things happen. Some examples are: At Home, Out for the Day, Asleep, Be Right Back, Vacation and you may also have several other custom modes you can setup. Let's say you are going on vacation for a week... select vacation mode. Your security system will arm to away mode, thermostat will be set at the temperature you choose, doors will automatically lock, turn on a light schedule to make it appear you are home and send you alerts, pictures and video clips of the things you want to be notified of while you are on holiday. Too bad it can't take your dog for a walk.